For an overview on open licensing and Creative Commons, please see the Week 1 post. How to decide which open license to use? Not all education materials available under a Creative Commons (CC) license are OER. Review this chart that details which CC licenses work well for education resources and which do not. The easiest way to confirm that an education resource is an open education resource that provides you with the 5R permissions is to determine that the resource has been licensed under a Creative Commons license (or is in the public domain) that permits the creation of derivative works. Any of these CC licenses are OER-compatible: CC BY, CC BY-SA, CC BY-NC, or CC BY-NC-SA. 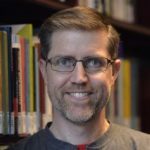 Choosing the right license for your OER requires you to think about which permissions you want to give to other users – and which permissions you want to retain for yourself. 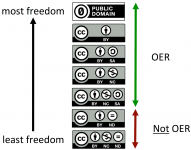 Read the “Open Textbook Community Advocates CC BY License for Open Textbooks” and think about why they recommend the Creative Commons Attribution License (CC BY) for education. You can find similar text with more arguments made about this same license for publishing scientific research in “Why CC-BY?” from Open Access Scholarly Publishers Association. Note: There are thousands of examples of educators using CC licenses to expand access to effective educational resources and to improve pedagogy in learning spaces. This is a very small set of examples from the global open education movement. Action #1: Review the CC license suite and think about which open license will meet your needs. Add a CC license to one of your educational resources (to which you hold the copyright) and share it with another educator. Action #2: Review the international examples above and think about whether you could launch a similar initiative in your country. If you’re interested, reach out to a project and start a conversation.